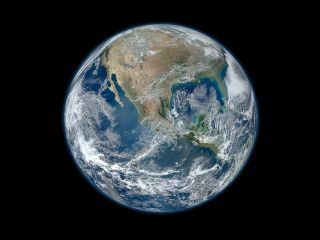 NASA has unveiled a 64 million pixel image of the earth, taken from one of its satellites in January. The image is actually a composite image made up of a number of photos of the Earth's surface shot on January 4, 2012. Measuring 8000 x 8000 pixels, the image comes from the Suomi NPP satellite, which is the first in a new generation of satellites to observe the different aspects of a changing earth. On board it carries several instruments for observing the globe, of which the biggest and most important is the Visible/Infrared Imager Radiometer Suite, or VIIRS for short. Sitting 514 miles above the surface of the earth, it is able to get a complete view of the planet every day. The first image that was released showed the entire globe in one composite shot and was released back in November 2011. VIIRS is capable of imaging the surface of the earth in long wedges which measure approx. 3,000 kilometers (1,900 miles) across. The latest image, named "Blue Marble" by NASA, instead shows a section of the globe containing North America. The VIIRS satellite sees the Earth at around 250 metres per pixel, and will be used to record a variety of things such as ocean temperature, clouds, and the location of fires. NASA uploaded the shot to its Flickr stream on January 25th, where it has been viewed more than 1.3 million times since.